The long-awaited revision of the text that brought growth theory to the classroom. Introduction to Economic Growth is the only text to synthesize the journal literature in a way that makes this important field accessible to undergraduates. 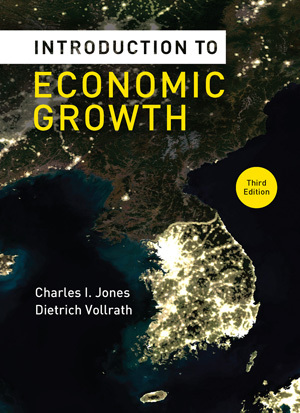 Charles I. Jones and new co-author Dietrich Vollrath have updated and revised the text to reflect recent advances in Economic Growth Theory in clear, direct language. Author Chad Jones (Stanford University) is a major researcher in the field of economic growth and is known for his ability to synthesize information. New author Dietrich Vollrath (University of Houston) is a recognized contributor to the field and brings up-to-date research to the Third Edition. Economic growth is one of the most important fields in economics and can be quite technical—but Introduction to Economic Growth uses a clear, direct writing style and requires minimal background in math.